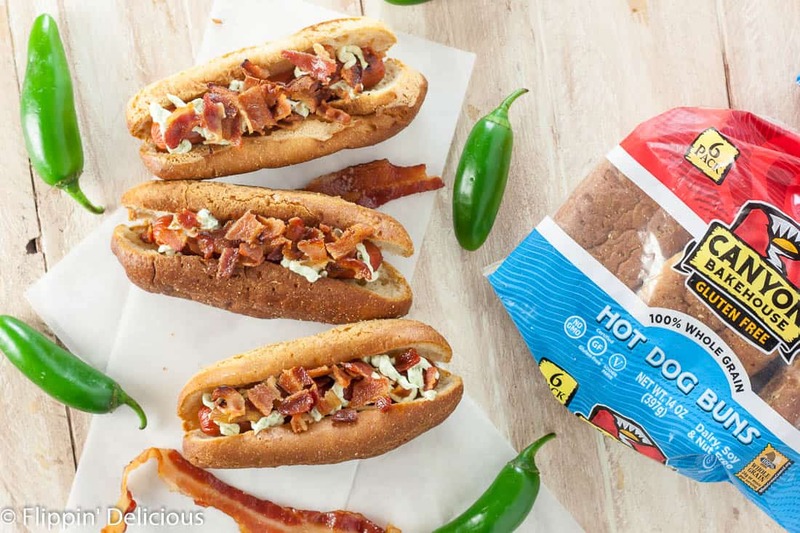 Gluten Free Jalapeno Popper Hot Dogs combine all of the flavors of your favorite spicy appetizer in a juicy grilled hot dog with bacon and a creamy jalapeno spread. This post is a part of my partnership with Canyon Bakehouse. I honestly and truly LOVE their products. I love working with them and sharing their products with you. As always, all opinions are mine alone. Thank you for helping me in supporting Flippin’ Delicious™ and the companies that support it. Jalapeno poppers are a quintessential appetizer. Spicy, cheesy, covered in bacon. What more could you want? How about a soft gluten free hot dog bun and a sizzling grilled hot dog! 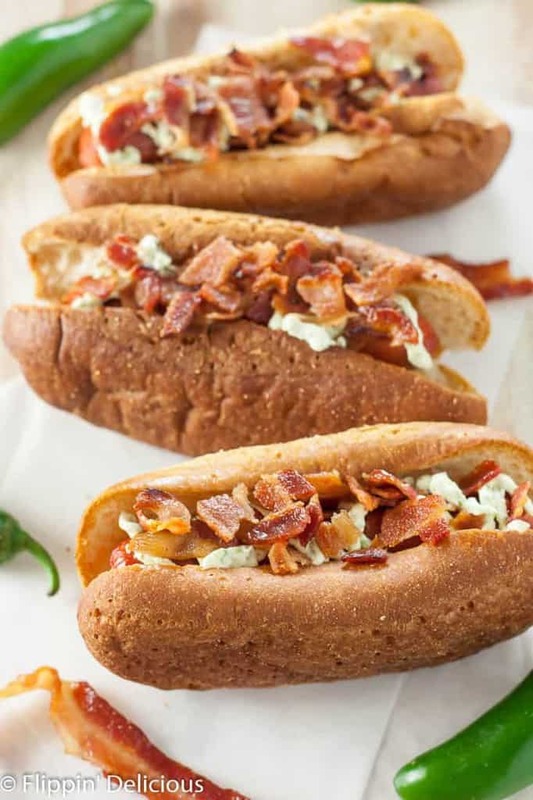 These winning hot dogs have all the flavors and textures of jalapeno poppers and are perfect for your next backyard bbq. 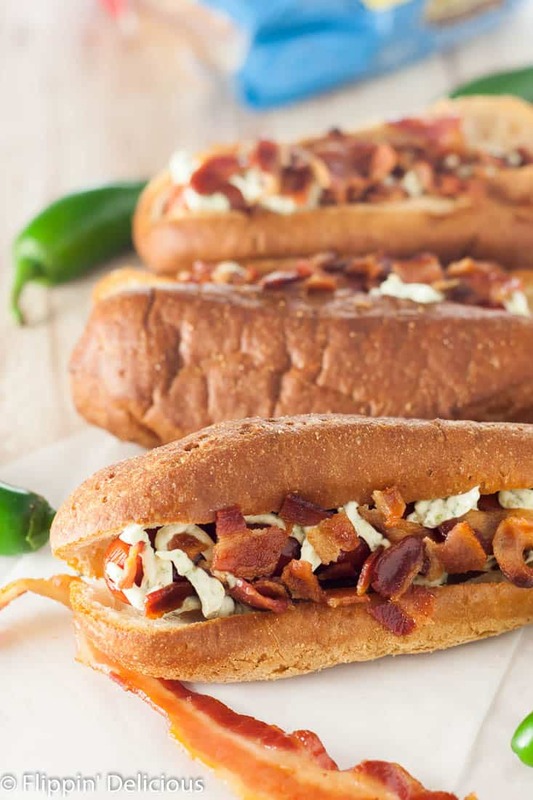 Whether you are grilling for a crowd, or for the people you love the most, everyone will flip for these gluten free jalapeno popper hot dogs. 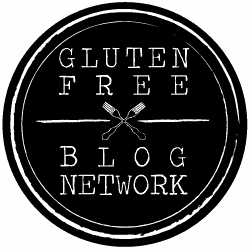 Grill up some Gluten Free Teriyaki Grilled Pineapple Burgers, bake some gluten free soft frosted sugar cookies and you’ll have quite the feast! The jalapeno cream cheese spread is what really brings the jalapeno popper flavor to your hot dogs. And it is really simple to make (and you can make it ahead!) It is so good, I want to put it on ALL THE THINGS. I just put it on my mac and cheese for lunch yesterday…. The first step is to char your jalapenos. I used my kitchen torch to blacken them, but you could also do it on your grill, over the flame of a gas range, or by placing them under the broiler. The key is to turn them often, whatever method you are using, so that they blacken evenly. You want to burn those peppers! The skin will crackle and pop as it blackens, and it will make your kitchen have an amazing smokey pepper smell. I pureed my jalapenos with some cream cheese (I used dairy free cream cheese) and then I put it into a plastic bag with the corner cut off for easy hot dog application. You can also spread it directly on the buns. Speaking of buns, I was very excited to try Canyon Bakehouse’s Gluten Free Hot Dog Buns. Over the past 2 years my family have become avid hot dog eaters (one of my favorite toppings is melty cheddar cheese, relish, and raspberry jam. It is amazing! Don’t knock it ’til you try it.) With the increase in hot dog consumption, comes a greater need for a good gluten free hot dog bun. I was impressed with how soft they were! I lightly toasted mine on my grill while I was cooking my hot dogs. I finished off my jalapeno popper hot dogs with a generous sprinkle of crumbled bacon. Because bacon. The bacon brings that amazing smoky, salty, greasy crunch! The jalapeno popper cream cheese spread brings that roasty-toasty spicy jalapeno flavor and is soooo creamy. And it all comes together in a soft gluten free hot dog bun! Roast the jalapeno peppers(turning frequently) until evenly blackened on a grill, gas range, under the broiler, or using a kitchen torch. Immediately place in an air-tight container or seal in a bowl with plastic wrap. Let sit for 10 minutes. Seed the jalapeno peppers, cut them in half lengthwise, and scrape the skin off with the back of a knife. The roasted jalapenos sound fabulous! Perfect smoky spicy bite! So many good things in one bite! My hubby will absolutely love these!!! Thank you Celeste! I hope that your whole family enjoys them. Wow I bet theses are awesome! Love that bacon on top too! Thanks Emily! Everything is better with a little bacon on top. I know what I’m making for Father’s Day! That is a great idea Amanda! I hope that your husband and dad love them. 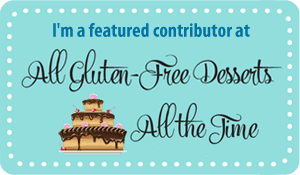 These look amazing, going to share with my gluten free friends! Looks great! Fun summer treat!